In 2010 I travelled to Uganda to work with orphans with complex backgrounds. It was an eye-opening experience and incomparable to the news we hear from the Western world. There is something truly different between experiencing a country in the flesh, and reading and seeing it on the news. When you are there, you not only see, you feel, smell and taste the vibrance of Africa that no documentary can ever really capture. 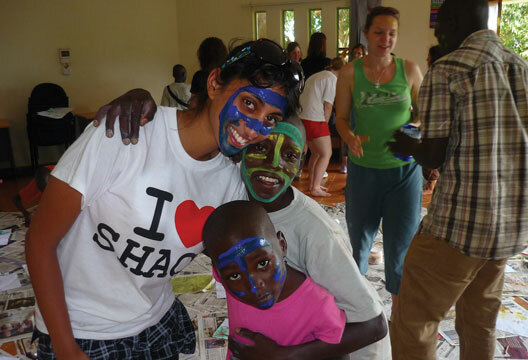 At the time I was studying psychology at the University of Birmingham and was keen to gain more experience in working with children with complex psychological difficulties in developing countries. I currently work as a senior assistant psychologist in a Child and Adolescent Mental Health Service (CAMHS) and I have found that I often reflect on my time in Uganda and recall the events that have had such a significant impact on my professional and personal life. I travelled with a charity and volunteered as part of the group, who were mostly European. Over the weeks we familiarised ourselves with a local orphanage and met all of the children. We spent time socialising, playing games and visiting the local zoo. The majority of the younger children did not speak any English, and instead we communicated through our play and use of gesture. All of the children, despite having faced significant adversity and trauma in their lifetimes, greeted us with smiles and laughter. Many of the children in the orphanage had contracted AIDS/HIV from their parents, and the majority of them had become orphans due to parental deaths. Some of the children were no more than two years old and despite experiencing such devastation were still able to form secure attachments with the other orphans. The first time I visited the orphanage, I felt a strong sense of community and family. Everyone responded to each other with respect, compassion and loyalty, regardless of age. I reflected on my own family interactions, and how spending more than a fortnight on holiday with my elder sister often resulted in an argument! Here, each individual seemed to respond to the other with empathy and compassion, and the two founders of the orphanage reported that disagreements amongst the children were usually quickly resolved. During the time that I spent in Uganda, I spent time getting to know each of the children and engaging them in play. They taught me games and songs, whilst I taught them British nursery rhymes. Another part of my role was to encourage the children to use creative methods of expressing their grief and trauma. For example, we spent time painting different scenes with different themes, such as happy and sad moments, family, friends and their aspirations for the future. Each child then had the opportunity to describe their painting and what each part meant for them. This was a very powerful exercise and allowed me to reflect on my own childhood and consider how different my life might have been if I had not been born into a life of limitless opportunity. I questioned whether I would have the resilience and strength of character that each of these children had, to endure and overcome such adversity. We also told the children the stories of local chimpanzees, rescued from poachers. Violet was a chimpanzee found when she was one year old, hiding under her dying mother in a forest trap. Caged, starved and abused by the poachers, when she was rescued and relocated to the Sanctuary she had to be kept separate from the other chimpanzees, as she was in a very vulnerable state. Refusing to eat, she would sit in the corner of her enclosure and rock back and forth during the night. These stories gave the children an opportunity to talk about their own traumas or observe the similarities of their experiences. We used chimpanzee pictures to facilitate their recognition and expression of the emotions that they were feeling, alongside the emotions experienced by each of the chimpanzees. These ways of quickly developing strong relationships with the children is something I remind myself of every day in my professional life. I try to use self-disclosure in sessions, whilst maintaining the boundaries of professionalism, because it allows the young person to identify and relate to you as empathising and understanding their position. It also allows the young person to gain real-life examples of how the psychological intervention works, whilst developing trust and motivation to engage with the work despite its challenging nature. During my time working with the orphanage, the founders felt that it was important for us to see the slums where all of their children had come from. None of us knew what to expect, having never travelled to a slum previously. When we arrived, the founders of the orphanage suggested that we remove all jewellery from our body and empty all of our pockets in the bus. We began walking through the crowded narrow lanes of the slum and immediately people approached us. Our guide explained that women and young girls in the slum tend to hide within the mud huts during the daytime, in order to avoid physical and sexual abuse from men. This was very difficult to hear, and I remember feeling incredibly vulnerable as a woman in leggings and a T-shirt being poked and prodded with curiosity from various angles. I saw several people with severe physical health problems, including open wounds and many people missing limbs using sticks as crutches. The harshness of the situation caught me off guard, and I noticed guilt build within me as I considered the luxury and convenience of the NHS at home. I think this scene certainly made me value the health care we are ‘entitled’ to in the UK. When I find myself becoming impatient that I can’t get a GP appointment within three weeks, I remind myself of my visit to this slum. Perhaps we can also take our education system for granted. People make statements about the importance of ‘getting a job’, but unfortunately the majority of government-funded schools in Uganda do not have reliable teacher attendance, making education a significant struggle for those with little resource to fund their child’s path through school. Added to this, the unemployment rate in Uganda is high, which makes it very difficult even for college graduates to obtain jobs. The combination of poverty, trauma and limited access to good education and healthcare systems makes it a significant challenge for individuals to achieve a sustainable lifestyle. As we moved further through the slum, I quickly lost my bearings, which was a frightening experience. But generally, we were greeted with curiosity and a warm welcome, so my memories of this experience and the people are positive ones. I would not trade it for anything, and I constantly reflect on my time spent there, to remind myself of the strength, resilience and motivation those children had, in order to overcome these significant challenges. In my professional work I believe that my experiences of different cultures has allowed me to develop strengths in empathising with others experiencing poverty of mental health regardless of their unique past experiences and cultures. Establishing rapport and being able to identify with clients with different life experiences from yourself can be challenging, but my time in Ugandan orphanages and slums has certainly positively impacted on my ability to do so with respect and sensitivity. I learnt a lot around how effective communication expands so much further than speech alone, and actually facilitates a connection to that other person in the interaction. I was able to communicate with each and every one of the young people in the orphanage, whether they were two years or 18 years old, speaking English, or speaking Luganda. I use these essential skills – relying not only on speech, but also gesture, facial expression, posture, mannerisms and appearance – every day in my work with children and young people with varying presentations, from learning depression and anxiety disorders to learning disability. I would urge people to visit Africa: I can say with confidence, having visited nine African countries, you will fall in love with its beauty, people, culture, wildlife and cuisine.